The All-New Nissan LEAF, the world’s best-selling electric vehicle, was named the “2018 World Green Car“ at the 2018 New York International Auto Show. LEAF is the icon of Nissan Intelligent Mobility, the company'’s vision for changing how cars are powered, driven and integrated into society. The first all-electric vehicle to win the World Green Car award since the category’s inception in 2016, the 2018 Nissan LEAF has been reinvented for its second generation and combines greater range with a dynamic new design and the latest Nissan Intelligent Mobility features including ProPILOT Assist, e-Pedal, automatic emergency braking and more. “We’re very proud that since Nissan LEAF launched in 2010, we’ve been able to put more than 300,000 zero-emission electric vehicles on the road worldwide, helping to reduce carbon footprints around the globe,“ said Daniele Schillaci, Executive Vice President, Global Marketing and Sales, Zero Emission Vehicle and Battery Business; Chairman of Management Committee for Japan/A&O; Nissan Motor Company. 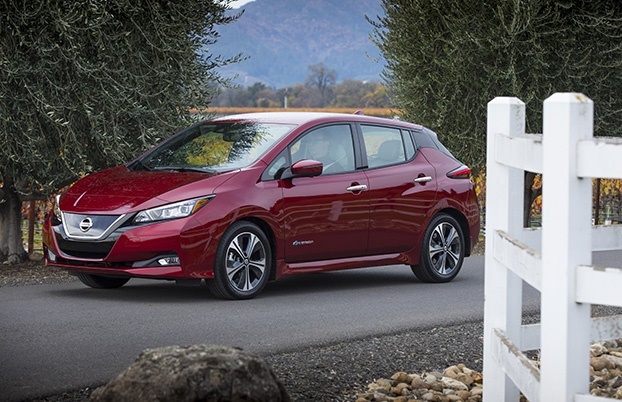 The 2018 Nissan LEAF rose to the top among a list of five initial category entries and was the stand-alone EV in the running. Jurors considered the vehicle's overall environmental impact including tailpipe emissions and fuel consumption upon selecting the overall winner. “The first LEAF was good, the new LEAF is better, so it’s an easy choice for the Green Car award,” said Australian World Car of the Year judge, Paul Gover. “The extra range is the major advance, but Nissan has also added extra performance and more practicality. “At a time when the world is looking for honesty and realism in new technology, the LEAF gets The Tick from me.” The previous-generation Nissan LEAF was named “World Car of the Year“ in 2011 and remains the only pure electric vehicle to win that award in its 14-year history.